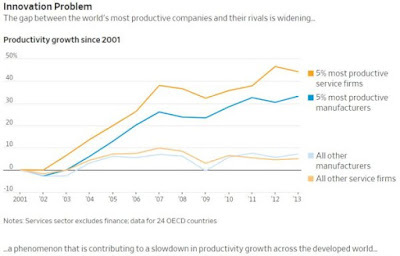 While top companies are getting more productive, gains are stalling for everyone else. And the gap between the two is widening, with globalization and new technology delivering outsize rewards to the titans of the global economy. The project shows how big firms can exploit economies of scale offered by new technology and global markets. Companies with more orders can better shoulder upfront investments because each new unit produced will be less expensive. As far back as the industrial revolution, major innovations have traveled swiftly from company to company and industry to industry, an economy-boosting phenomenon called diffusion. Today, there is mounting evidence this engine of growth seems to be misfiring, a phenomenon some economists say helps explain the slowdown in productivity growth bedeviling developed economies. Productivity, usually measured as output per hour or per worker, refers to the efficiency with which goods and services are produced in an economy. Boosting productivity—raising the amount of goods and services produced by each worker—is one of the most important long-term drivers of rising living standards. 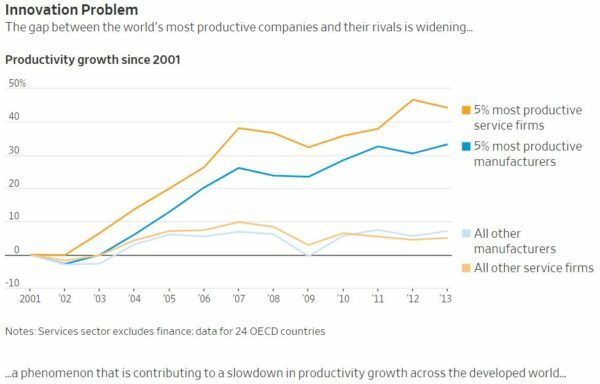 Lately, economists have discovered an unsettling phenomenon: While top companies are getting more productive, gains are stalling for everyone else. And the gap between the two is widening, with globalization and new technology delivering outsize rewards to the titans of the global economy. “Whatever good stuff is happening at the high end is not diffusing down to the tail,” says Andrew Haldane, chief economist at the Bank of England. Productivity ills can ultimately hurt living standards, and any gap between top companies and the rest can exacerbate income and wealth disparities. So what is going wrong with the spread of innovation? In the tiny town of Gullringen, Sweden, one of the world’s largest construction firms, Skanska AB , has a partnership with furniture behemoth IKEA that has brought innovative ideas to the construction of affordable houses. The venture, called BoKlok, relies heavily on robots to build ready-made rooms inside a factory. Later, on construction sites throughout Northern Europe, the rooms are put together like Lego houses. Skanska says the process cut in half, to nine months, the time it takes to erect and furnish a four-story apartment building—right down to the clothes hangers in the wardrobes—and reduced costs by 35%. The Gullringen facility churns out 1,200 affordable houses a year and is poised to increase capacity by 50%. The project shows how big firms can exploit economies of scale offered by new technology and global markets. Companies with more orders can better shoulder upfront investments because each new unit produced will be less expensive. “Now we are aiming at increasing our level of automation significantly, when we really know the demand from the market and have the volumes to pay for it,” says Jerker Lessing, BoKlok’s director of research and development. “We benefit from Skanska being a global company.” Three hours away, in the town of Hallstahammar, a smaller Swedish construction firm focused on the domestic market also tried to industrialize production a few years ago. The company, NCC AB , couldn’t make it work, and the factory was shut down. “It is difficult to have housing factories or other solutions with high fixed ongoing costs when the market fluctuates as it does in Sweden,” says Madeleine Nobs, business-development manager. NCC says it now focuses on standardized design processes that optimize costs without the need for a factory. Since the 2008 financial crisis, U.S. productivity has grown by about 1.2% a year. That is half the rate it clocked in the 1970s and around one-third of what it was in the decades after World War II, once adjusted to strip out the temporary effects of economic booms and busts. Japan and Europe—especially the U.K. and Italy—have fared even worse. Researchers have blamed the productivity slowdown on a range of factors including ultralow interest rates, mismeasurement of output in a digital world and a decline in humanity’s innovative prowess. Most theories don’t seem to explain the whole puzzle. Researchers now are zeroing in on diffusion. According to data on advanced economies from the Organization for Economic Cooperation and Development, the most productive 5% of manufacturers increased their productivity by 33% between 2001 and 2013, while productivity leaders in services boosted theirs by 44%. Over the same period, all other manufacturers managed to improve productivity by only 7%, while other service providers recorded only a 5% increase. “The laggards are increasingly falling behind,” says Dan Andrews, the economist who led the OECD’s research into diffusion. The bifurcation of the global economy has pocketbook consequences for ordinary workers. The National Bureau of Economic Research found that nearly all of the increase in wage inequality in the U.S. since 1978 stems from pay disparity between workers at different companies. Pay gaps within companies remained mostly unchanged. The productivity disparity dates back to before the financial crisis. The McKinsey Global Institute, the research arm of a U.S. consulting company, found that one-quarter of U.S. productivity growth between 1995 and 2000 was driven by retailers, with almost one-sixth of that by a single company, Walmart Inc. Smaller rivals were left in its wake, if they survived at all. These days, retailers are under threat from online competitors such as Amazon.com Inc., spurring a new productivity race at the top. In May, Kroger Co. , the largest U.S. grocery chain, increased its stake in tech-heavy British grocer Ocado Group PLC. Within three years, Kroger will be able to use Ocado’s robots to run 20 automated warehouses, the company said. Data show the most productive companies are usually the biggest. Globalization allowed them to grow bigger, while giving some specialized niche firms a big enough market to succeed. For digital titans such as Amazon, Google parent Alphabet Inc. and Facebook Inc., the benefits of scale are substantial. Not only are their customers not limited by geography, but whenever more sellers sign up in Amazon’s platform or more users join Facebook’s social network, the service they offer gets more valuable for everyone else. Another advantage: Researchers have found that bigger firms are better at protecting their technological advantages by patenting them. Only 25 companies accounted for half of all tech-related patents filed with the European Patents Office between 2011 and 2016, official data show. Scale makes it possible to experiment with advanced technology that is out of reach for many companies. A separate McKinsey Global Institute report, published in April, found early adopters of artificial intelligence may already have gained “an insurmountable advantage” in earnings over competitors who have yet to take the plunge. Gains at the top have been the key driver of productivity since the days of the industrial revolution, and the whole economy benefited. What is different now? Some economists say it could be that good managers have flocked to top firms—enticed by the larger pay offered by multinationals—and the laggards need to catch up. According to the World Management Survey, smaller firms are consistently worse run and are responsible for most differences in management across countries. Some public and private efforts to reverse this are taking place in Britain, where productivity has become a political hot potato after a decade of poor growth. Output per hour worked there is 23% and 26% lower than in the U.S. and Germany, respectively. At the U.K.’s Manufacturing Technology Centre in Coventry, England, Dean Baker leads a group of experienced former engineers who offer tips to small and midsize firms on how to improve their manufacturing processes. They also try to demystify the latest technology, such as 3-D printing, robotics and machine learning, which can appear daunting. They argue that the cost of using such innovations is falling. “It’s to show that these things can be used by everyday companies,” says Mr. Baker. A big chunk of productivity growth comes from automation, but some economists warn it is a double-edged sword. While some companies become more productive by substituting machines for laborers, there is no guarantee that the displaced workers will find a job that is equally productive. Globalization made it easier to automate sectors that produce goods and services that can be traded around the world, but this means those sectors now employ far fewer people than they did 40 years ago. Recent research finds that the result may be a shift in employment toward lower-productivity jobs such as delivering fast food by bike or cleaning offices—much harder tasks to automate. Paul Pritchard is a manager of Abacus Consultancy, an accounting firm that employs six people in London. He is passionate about the latest technology and has set up a platform that allows his clients to manage their finances remotely. His competition is auditing giant PricewaterhouseCoopers LLP, which recently developed a software tool that can scour thousands of pages of legal contracts in minutes. It allows one client media company to review contracts related to media rights 30 times faster than doing it manually, and at one-eighth of the cost, says PwC’s forensic technology partner Craig McKeown. By developing the technology itself, PwC reaps all the productivity gains. Abacus Consulting has access to a similar tool, but it has to pay another software company to use it, reducing its productivity gain. Building the software “wouldn’t be viable for a small business like mine, as the costs would be too high for development and we wouldn’t be able to offer the same security as larger providers can,” says Mr. Pritchard. Jürgen Maier, chief executive of the U.K. arm of Siemens AG , says reviving diffusion is in the interests of the biggest, most productive companies, because many laggards are their suppliers. “If we get our supply chains more productive, more agile, delivering in time, that’s good for everybody in the ecosystem,” Mr. Maier says.